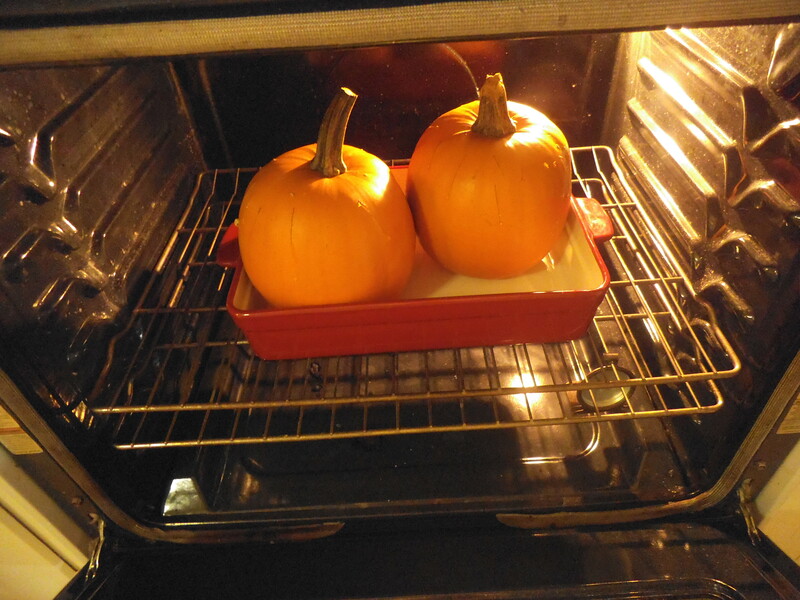 How to Cook a Whole Pumpkin, it’s simpler than you thought. The first time I cooked my garden pumpkins for pumpkin puree, I thought it would be a lot of work and it really isn’t. 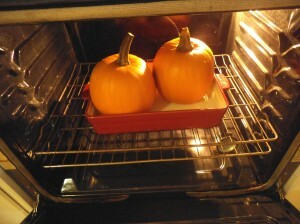 I love the smell of the pumpkin cooking and you also get to roast some pumpkin seeds. 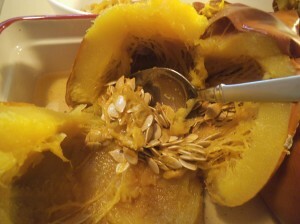 With this recipe you cook the pumpkins whole which is simple and I’m all about doing things in a simple way. This year I had a volunteer pumpkin plant pop up in my side yard. 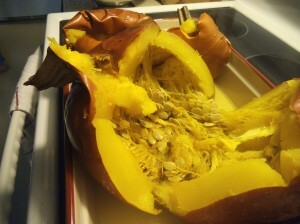 It grew enormous and produced 15 cooking pumpkins. I cook two at a time. 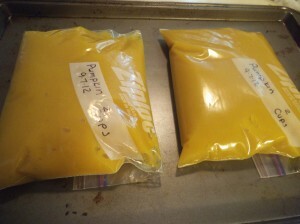 I use a lot of pumpkin in the winter. It’s a favorite of mine. Give it several stabs to break the skin. Don’t want that baby exploding in the oven. Some suggest waiting until it’s cooked for about 15 minutes and the skin is not as hard. I don’t wait I just stab away. Watch those fingers! Place on low rack in oven and bake for 1 1/2 hour or until fork tender. Remove from the oven and slice in half to cool. Let it cool about 30 minutes. Scoop out the seeds and pulp with a large metal spoon. You can clean and roast them later if you like. Remove the skin. It should peel off easily. Use a knife if you need to. 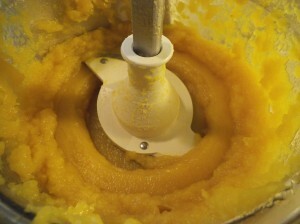 Put a few chunks in the food processor and puree. 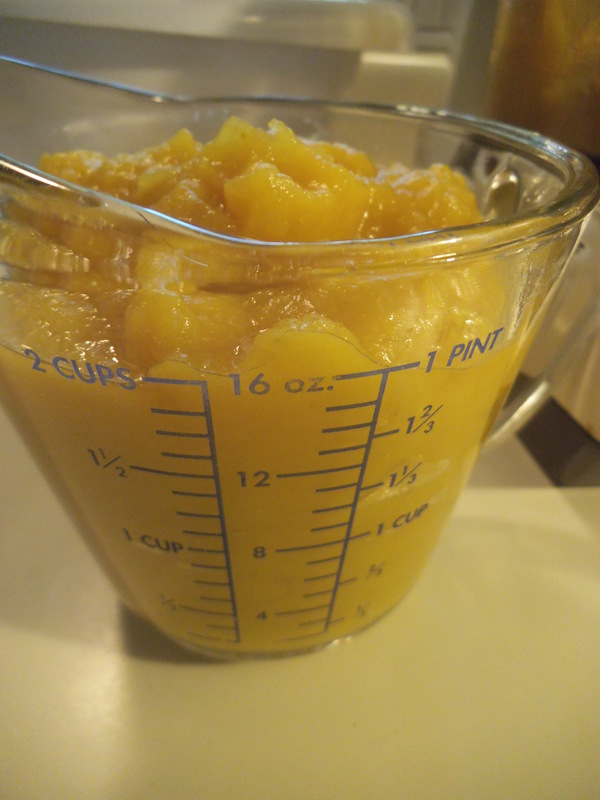 I measure it into 2 cup portions to freeze in a freezer bag or a container. That amount works best for me. You can decide what works best for you. 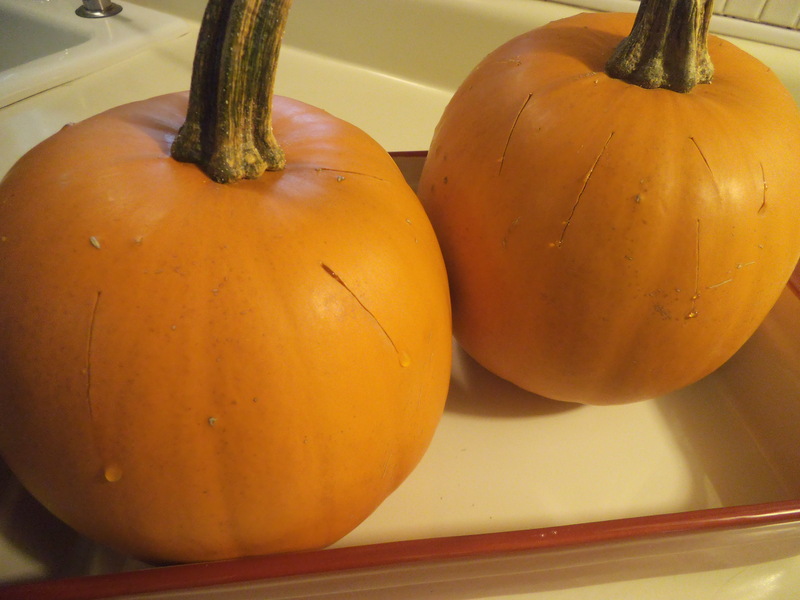 2 pumpkins usually yield about 6 cups. 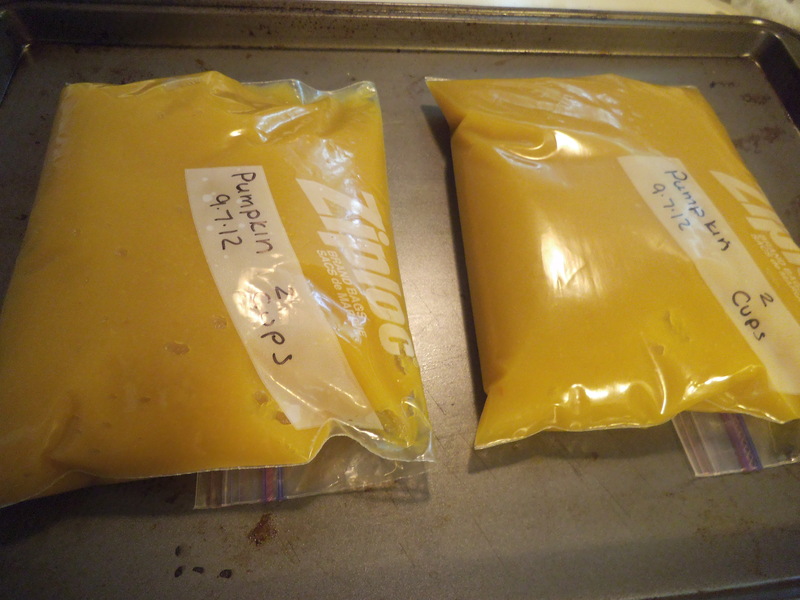 I’m freezing 2 bags and using the other 2 cups to bake something delicious today 🙂 You can lay them flat on a cookie sheet and put them in the freezer so they will stack better when frozen and that means using up less of my precious freezer space. It seems like a lot of work. I enjoy doing it and love the way my house smells right now. So to me it’s worth the little extra effort it takes. Try it for your pies this Thanksgiving. Then you can brag that it really is a from scratch pie. (Post updated July 25 2017). I link to these fabulous parties. I can taste the pumpkin pie right now! 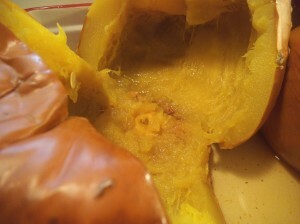 I love pumpkin but have not ventured out to cooking one on my own. Thanks for your sharing your tips for a puree! 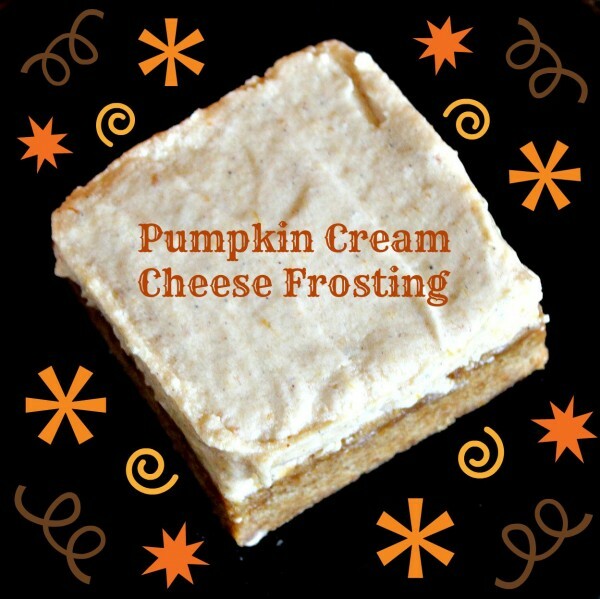 If you get a chance come link up your recipe at my Fall Edition Pin Party. Very interesting. I have never cooked a whole pumpkin. Thanks for sharing. The picture featuring the flowers and pumpkins is very beautiful. 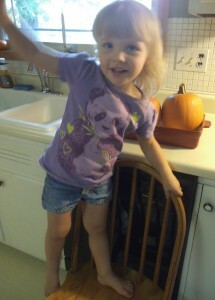 I love that you were serenaded with a pumpkin song. 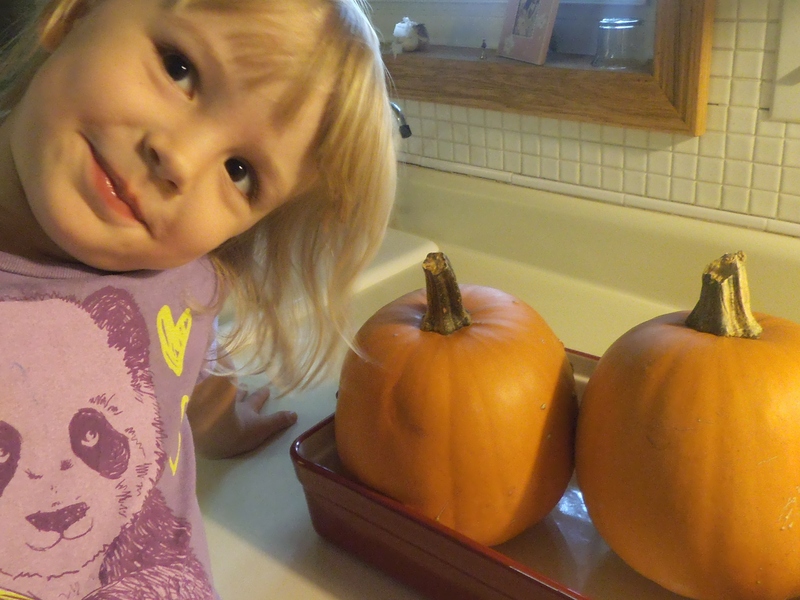 What a great day–pumpkin song, awesome smelling house, and fresh baked pumpkin…can’t beat it. Thank you for linking with See Ya In the Gumbo. Good to have you! Perfect instructions -could follow just the pics, you have them so detailed. 🙂 Thanks for linking-up at A Humble Bumble! yeah thanks for the instructions on how to do! 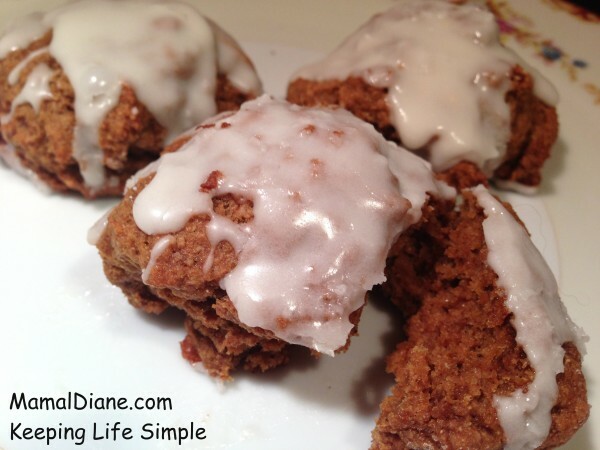 I would love for you to share this on the thrifty thursday weekly linkup! Thanks for this tutorial. 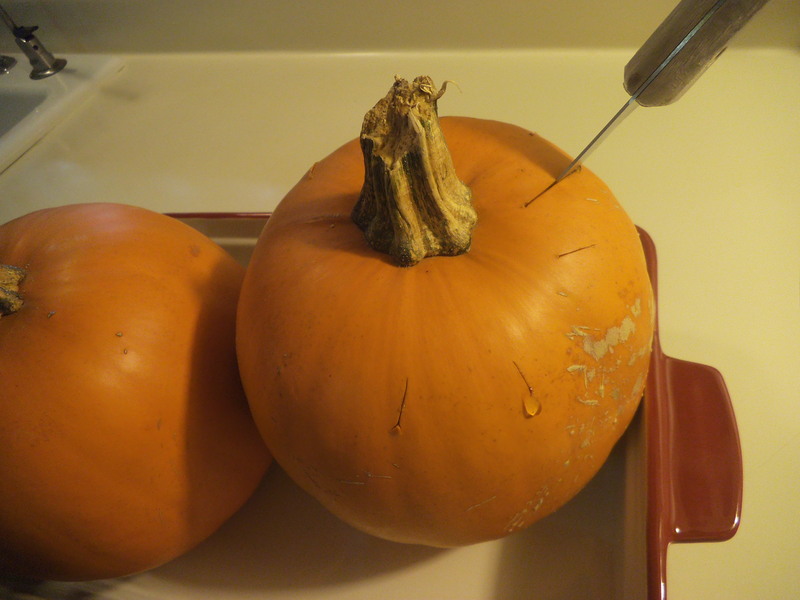 This seems easier than cutting up the pumpkin when it’s raw. I’m pinning this. Thanks for linking up at Take it on Tuesday. I have never ever thought to cook pumpkins this way! 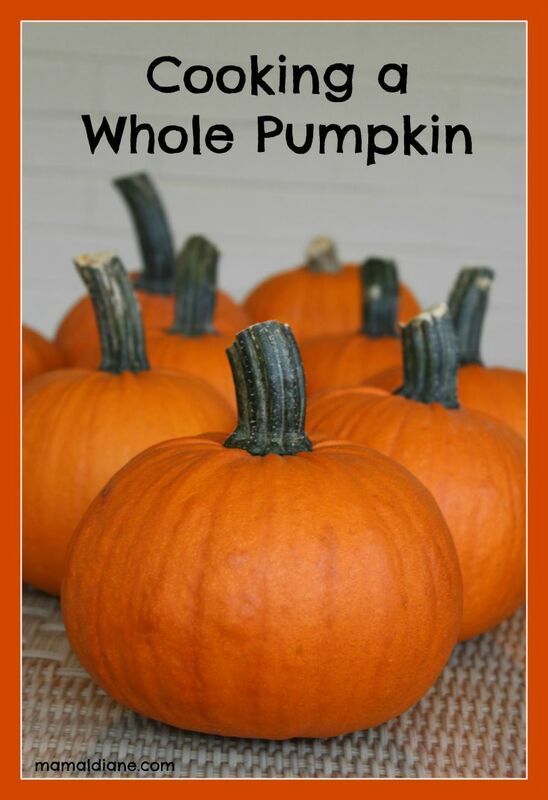 AWESOME tip – can’t wait to pick up my own pumpkins! 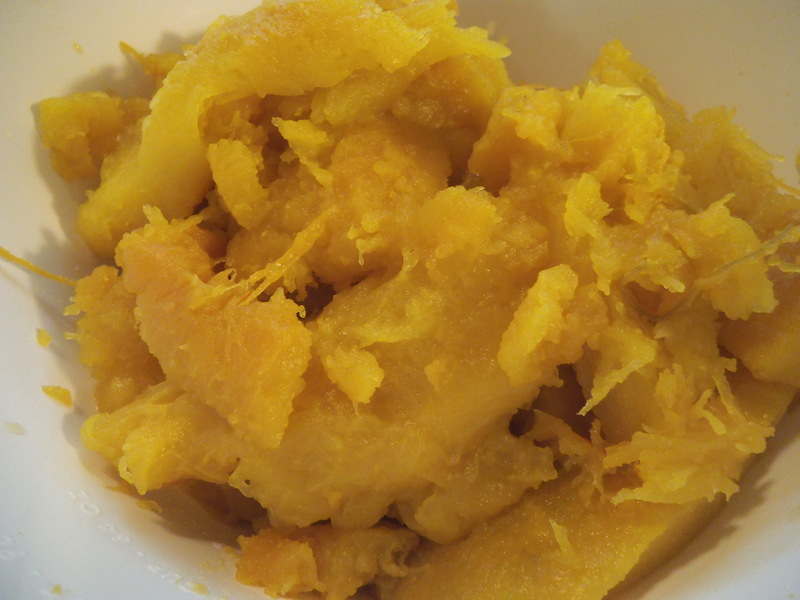 You just inspired me to give this a try and move away from canned pumpkin! I came by from the blog hop and I am really glad that I did. I hope you can stop by my blog and say hello!! I’ve never tried roasting a whole pumpkin before. That seems like a low-work way to get some delicious fresh pumpkin. Thanks for the tips! Your little helper is just adorable. This is a great tutorial for preparing the pumpkin, and the puree will be so good for cooking. Hope you are having a great week and thank you so much for sharing with Full Plate Thursday. This is great! I always thought you had to cut them up first! Very interesting. I just might try that this year. I have never thought or heard of doing this. I love cooking with my daughter too. Thanks!! 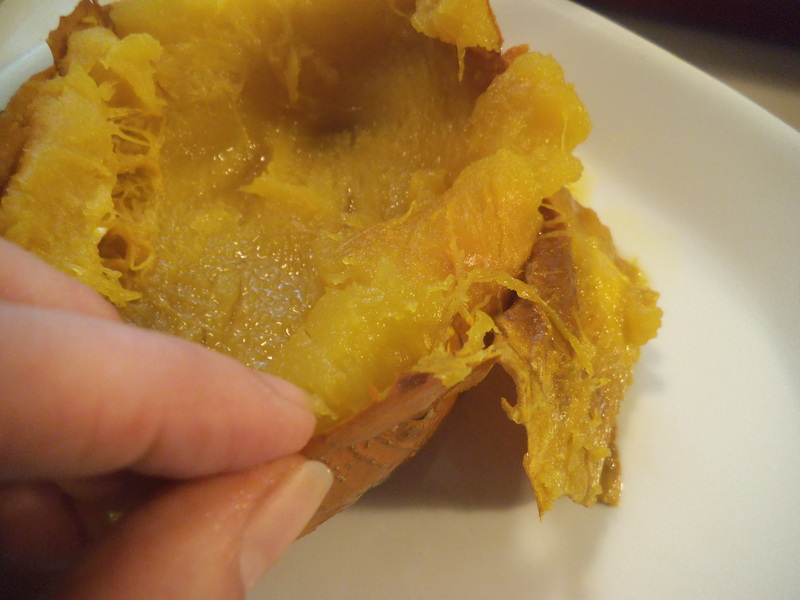 I have never cooked pumpkin (I confess to using canned!) 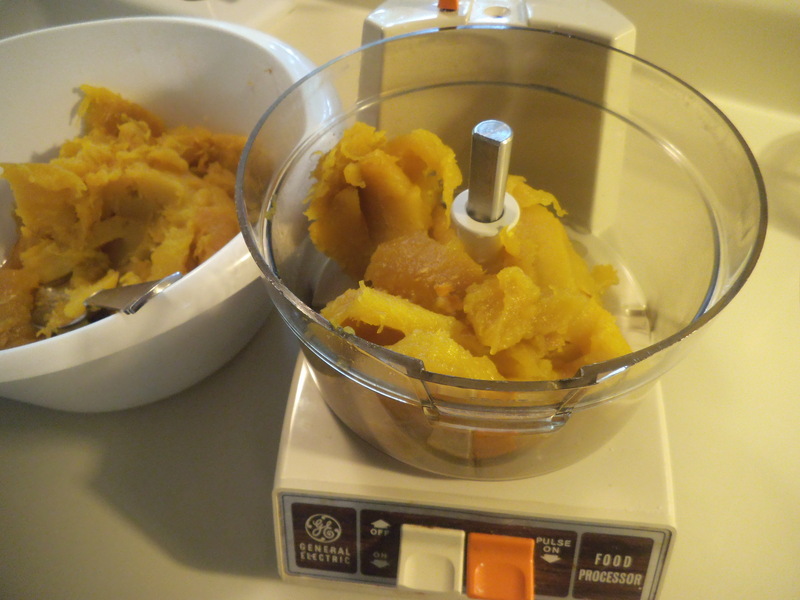 but this looks like a really straight forward process, and I do love roasted pumpkin seeds. 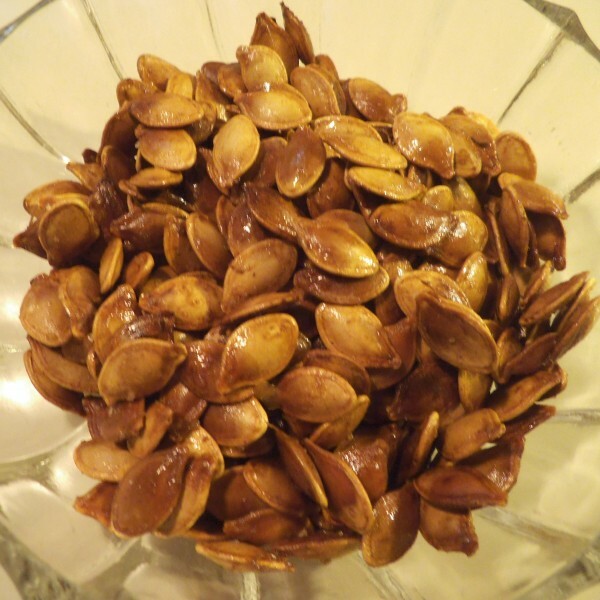 I remember my late Dad would clean and roast the seeds after we made Jack o’Lanterns at Hallowe’en. They were such a treat! I need to try to process my own pumpkin this year. This looks so simple! oh my goodness I bet that smelled great cooking. I don’t cook with pumpkin much. But I love this idea I may try it. Thank you for sharing at the Thursday Favorite Things hop. Your participation helps make it a success.I’m sorry I am slow to visit this week as I am fighting a nasty head cold and my time on the computer has been limited.Wishing you a beautiful day . Thanks for the directions, I always let them rot :-(, but lucky for me those rotten pumpkins from last year volunteered in my garden so I have at least 3 this year and would love to do something with them. 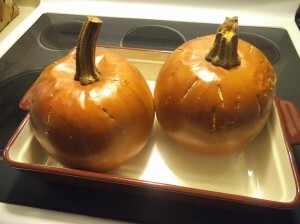 I cooked pumpkins last year for the first time and was amazed at how easy it was. Though our cooked pumpkin is for the dog since a bit in her breakfast is good for her digestion. Thanks for sharing on Tout It Tuesday. Hope to see you tomorrow. This is very convenient timing! We just bought 4 pie pumpkins. I am going to try this. Thanks so much for sharing on Natural Living Monday! I can’t wait to do this! 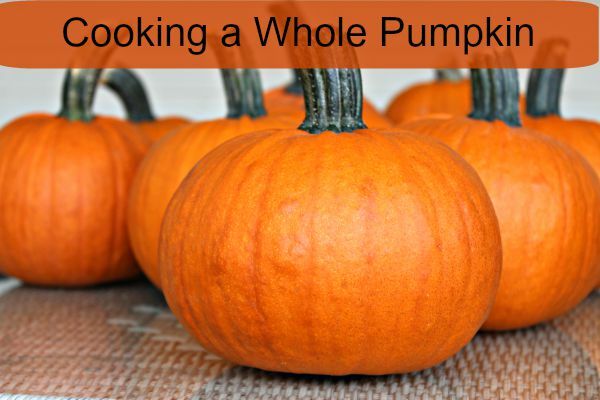 I didn’t know you could cook a whole pumpkin. 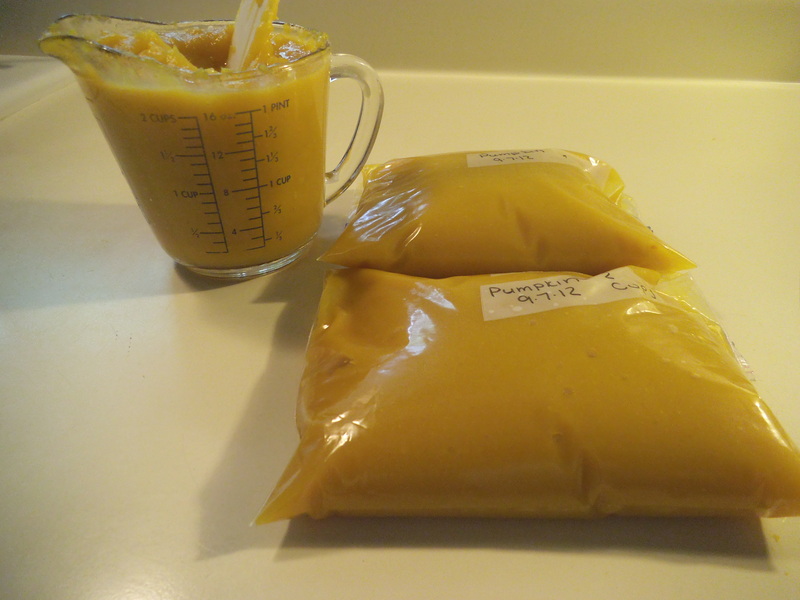 The last time I cooked pumpkin, I sliced it in half and did it that way, but at least now I can double the amount that I cook! I LOVE pumpkin pie!! If I only baked.